A 52-year-old man was arrested for producing and using fake $50 notes, the police said yesterday. 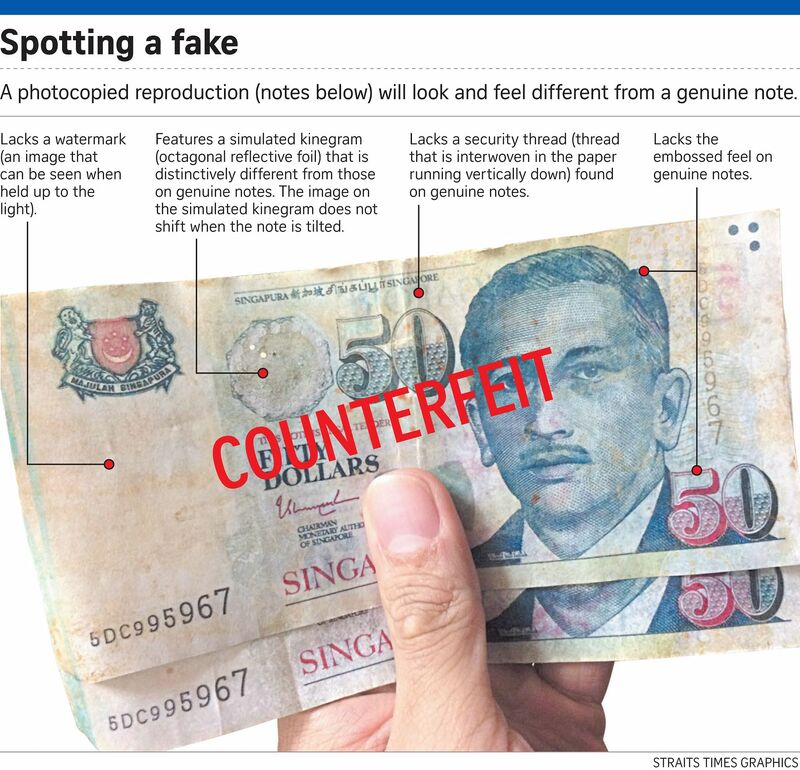 The police said they received a report at about 10am last Thursday that counterfeit $50 notes were used at a convenience store in Hougang Street 91. After investigations, officers from the Hougang Neighbourhood Police Centre found out the suspect's identity and arrested him in Hougang Avenue 8 at about 3.15pm on the same day. A printer, a bag and several $50 notes believed to be counterfeit were seized. To date, the fake notes in the cases reported bear these four serial numbers: 5DC995967, 4KT595133, 4AX921719 and 4LB831932. It was not known how many notes were seized, and the same serial number could have been used for more than one note. A photo of two fake notes with the first serial number has been circulating online and on messaging service WhatsApp recently. According to a post on online forum HardwareZone, the notes were supposedly collected at an NTUC FairPrice supermarket outlet in Hougang. In response to media queries, a FairPrice spokesman said: "We are currently conducting an investigation to verify the validity of this claim." He added: "As a responsible retailer, we take a serious view of the matter. It is our standard practice to immediately report all alleged cases of counterfeit currency to the police." All FairPrice outlets have the necessary devices, including ultraviolet light machines, to verify the legitimacy of the currency received, he said. Any fake currency found in its cash registers will be removed to prevent circulation and handed over to the authorities, he added. In the Hougang case, the counterfeit notes, which are believed to be photocopied reproductions, lack security features found on genuine notes, said the police. These include a watermark, which is an image that can be seen when the note is held up to the light, and a security thread that is interwoven in the note and runs vertically down. Unlike a genuine note, the simulated reflective foil on the fake notes does not shift when the note is tilted. The surface of the counterfeit notes also lacks the embossed feel of genuine notes. "Members of the public are advised to be alert to counterfeit notes of other serial numbers," the police said. In October last year, a 22-year-old man was jailed for four months for cheating and abetting his younger brother to cheat by using fake $100 notes to make purchases. Nordin Sirajuddin, a part-time sales marketer at his family-owned company, forged seven $100 notes from older series of currency, which do not have a security thread. He obtained sample pictures of the notes online and printed them on both sides of several pieces of paper using a colour printer. He later used the fake notes to pay for items at a convenience shop and supermarket in Punggol. In 2013, three cases of counterfeit $1,000 notes were reported to the police. Anyone found guilty of using counterfeit currency may be jailed for up to 20 years and fined.